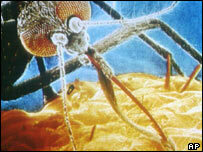 African health campaigners have accused western countries of deliberately ignoring an effective weapon against malaria. They say the chemical DDT could help fight the disease, which kills about a million people each year - 90% of them in Africa. Sprayed annually onto the inside walls of houses, DDT is the main method of malaria control for countries such as South Africa, Madagascar, Ethiopia and Swaziland. Used in this way, in small amounts under strict control, there is no conclusive scientific evidence that it damages human health or the environment. A number of other African nations including Uganda and Kenya are considering reintroducing DDT. But according to Richard Tren, Executive Director of the pressure group Africa Fighting Malaria, the western donors on which they depend will not help them. "The reason that DDT's not used in the US and Europe is because they don't have malaria," he says. "They did use DDT, and they got rid of malaria. Not a single donor agency will support the use of DDT or any other insecticide in indoor residual spraying." An investigation by the BBC's Earth Files produced evidence to support this claim. The Swedish aid agency Sida will not allow its funds to be used for buying DDT. The UK's Department for International Development funds 13 malaria-only projects in eight African countries, none of which uses DDT. The programme also found that some leading researchers believe the United Nations agency Roll Back Malaria is ignoring the potential of indoor spraying, which the researchers say has produced better results than treated bednets. These agencies all deny having blanket policies preventing involvement with DDT programmes. But activists maintain that western concerns over the very real environmental danger from widespread DDT use in agriculture is denying poorer African nations a choice in how they fight malaria.